I’ve become uncomfortably aware of the amount of books I had that have yet to be opened and read. I have been newly informed that this behavior of buying books but not reading is in fact experienced by many people and the Japanese have coined a word for it: TSUNDOKU. 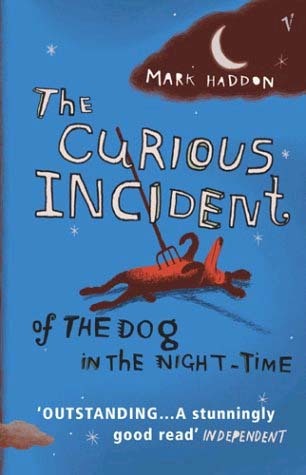 One of these books is Mark Haddon’s The Curious Incident of the Dog in the Night-Time. A simple story about an autistic child, Christopher Boone, who also happens to be the first person narrator of the entire book. I don’t know how Haddon did it but the tone and voice is very believable to be that of a 15 year old autistic child. The lack of emotion and social disconnect ironically made the story, in my opinion, more poignant and relatable. The story begins when the neighbor’s dog Wellington was murdered by someone with a pitchfork (no spoilers there as the cover and title practically says it all). Christopher, being a Sherlock fan (hooray, co-Sherlock nerd! ), took it upon himself to investigate what happened. In the course of his “investigation” what he will uncover will not only lead him to find out what happened to the dog but also what happened with his family. The story is simple but the challenge of conveying the emotions of the characters through the eyes of an emotionally-challenged child is a true feat to behold. Not once did the narrator break character. It’s not a cheap tear-jerker of a novel nor an action packed detective story but it’s a real page-turner because you can’t help but root for Christoper and understand the frustrations of his parents. I see now why this is almost every must-read list. I still have a long way to go, but here’s to finishing all my Tsundoku books!